Pearl Harbor - "A Date That Shall Live in Infamy"
I wonder how many (or how few) Americans who are not associated with the military in some way, or related to a WWII veteran, will even remember that this date, December 7, marks a major milestone in American history? "... we here highly resolve that these dead shall not have died in vain ...". I hope that resolve is still alive in the American people, nearly 150 years later. I know it is in our military. As a young naval officer, I had the profound honor and privilege to be onboard a US Navy ship entering Pearl Harbor. 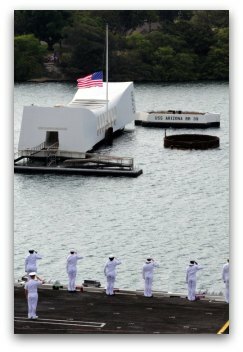 In a time-honored tradition observed each time a US Navy ship passes the USS Arizona Memorial, all hands not necessary to the ship's operation and navigation assembled "topside" to render honors to the 1,177 shipmates entombed there following the Japanese attack on Sunday morning, December 7, 1941, to the 337 survivors onboard the Arizona and to all those who were on the island of Oahu that day. I stood at attention, saluting as we passed the Memorial, and was overcome with pride and emotion, including gratitude for the sacrifices made by those who serve our country. Tears ran down my face and dripped onto my uniform. Although I was the lone female onboard the ship that day, I was not the only one moved to tears. It was one of the most moving experiences of my life, and one that I shall never forget. As a female Navy officer, it was a rare opportunity for me, made even more rare by the fact that I was a female Navy JAG officer. There weren't a lot of opportunities for us to go to sea in those days. But I had been fortunate enough to land an assignment (at my request) to ride a US Navy ship on the first leg of its Western Pacific (WESTPAC) deployment, from San Diego to Pearl Harbor, Hawaii. I am so grateful for that opportunity, because it gave me a much better understanding of the daily lives of our sailors at sea, and I think that made me a better Navy officer, and a better military prosecutor. It also helped me to understand, as a Navy spouse, what life at sea was like for my husband. I later had the opportunity to visit the USS Arizona Memorial, taking the Navy launch out to the memorial itself. That was just as moving, if not more so. The memorial is positioned over the hull of the ship, which is clearly visible under the water, sitting on the bottom exactly where it sank that day on Battleship Row. The mighty battleship sank in just 9 minutes, and then continued to burn for two days. There is no doubt, standing there peering down at the ship, that it is a living memorial. There were 1.4 million gallons of fuel on the USS Arizona when she sank. Today, 71 years later, approximately two quarts of oil a day still surface from the ship. 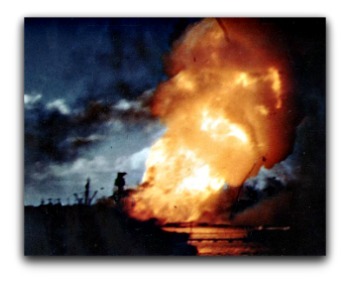 Pearl Harbor Survivors refer to the oil droplets as "black tears." "The Greatest Generation is becoming the oldest generation. Last year's 65th anniversary of the attack on Pearl Harbor marked the first time that every American alive at the time of the attack - even a newborn on that fateful day, Dec. 7, 1941 - had become a senior citizen. "Much of our attention during this year's 66th observance is directed on the military survivors of the attack. According to the Pearl Harbor Survivors Association, fewer than 5,000 - less than 10 percent of the military personnel on the island that day - are believed to be alive today. All are in their 80's or older. "Unfortunately, the day is rapidly approaching when the last of these survivors will be gone, and Americans will be unable to express our gratitude and admiration to them directly. 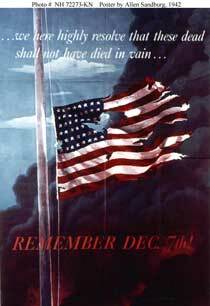 "Let us remember that the heroes of Pearl Harbor were pioneers. In the four years after that attack, more than 16 million Americans served in uniform and more than 400,000 lost their lives. "When the World War II Memorial was dedicated in 2004, the American Battle Monuments Commission launched an online registry, noting: "Any American who served in the armed forces or contributed to the war effort on the home front, whether in factories and shipyards or farms and neighborhoods, is eligible." The registry has grown to more than 1.5 million entries, arriving at a rate of more than 6,000 enrollments a month. "Clearly, Americans are eager to bestow further honor on the heroes - military and civilian - who became known as the Greatest Generation. And it all began at Pearl Harbor. "Today, a nation's respect and appreciation is trained on the heroes who served at Pearl Harbor, particularly the 1,100 who were wounded and the 2,300 who gave their lives." As the article points out, the membership of this elite group is rapidly dwindling, and those remaining are in their 80's and 90's. On December 31, 2011, the Pearl Harbor Survivors national organization, formed in 1958, officially disbanded, citing the advanced age and declining health of its membership. Local branches will continue their observances of the day that changed their lives and our world. America is rapidly losing the surviving members of "The Greatest Generation." The youngest of them will be 87-88. Please express your gratitude whenever you encounter them, while you still can. This country suffered a "second Pearl Harbor" on September 11, 2001, when Islamic extremists used airliners to attack the U.S. mainland. That has become the "date that shall live in infamy" for today's generations. Although most Americans today instantly recognize the date 9/11, how many still remember 12/7? I seriously doubt there are many Americans under age 50 to whom the date means anything at all. We MUST teach the lessons of history, and never allow our children to forget what happened that day, so we can be certain it never happens again. It seems to me that far too many Americans have become complacent in their daily lives, oblivious to the sacrifices that have been made, and will continue to have to be made, to give them the freedom to live the life they choose. I hope I'm wrong about that complacency. One of my husband's often-repeated sayings is "In the end, complacency will kill us all." I hope he's wrong about that, too. I hope enough Americans will recognize the threat to our nation that exists today. The "war" that resulted in the September 11 attacks began many decades before that, with slowly escalating violence against American interests, to "test" our response. But like the attack on Pearl Harbor, the attacks on New York City and Washington, DC, "awakened a sleeping giant." I just hope that giant isn't lulled into sleep again before the job is finished. This enemy, unlike those we have faced in the past, doesn't wear an identifying uniform. And it hides behind women and children. But it has just as clearly declared war on America and America's interests around the world. We owe it, not just to our children and grandchildren, but to those who died in the attack on Pearl Harbor and the brave veterans who fought for our future in World War II, to continue to uphold the legacy they left us, and to protect, preserve and defend the United States of America against all enemies, foreign and domestic. 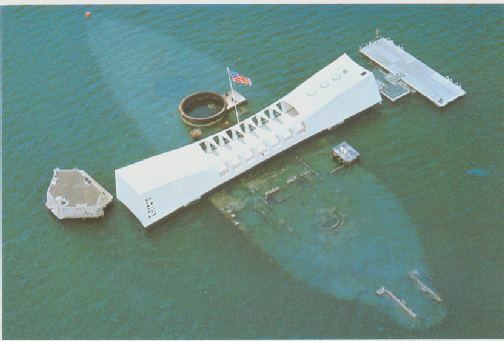 The current USS Arizona Memorial Visitors Center is in a state of rapid deterioration, and the landfill upon which it sits is sinking much more rapidly than anticipated. Help build the new Visitors Center. Interesting facts about the USS Arizona Memorial. Post your own message of thanks to our veterans. And while you're here, post your holiday messages for our troops. Return to top of Pearl Harbor Day.